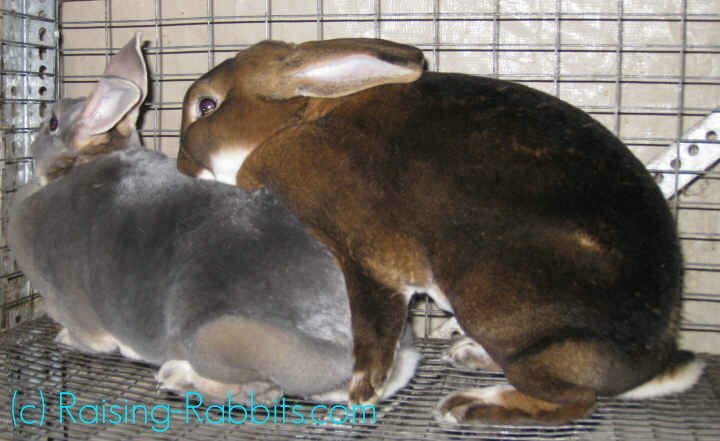 Rabbit Mating - tips, tricks and pics for ensuring successful matings and large litters of bunnies. About mating no buck needs lessons. And most of the year, the doe needs no coaxing either. Here's how to mate a buck and a doe together. Take the doe to the buck rabbit’s cage, always. Rabbits are territorial, and if you take your buck to a doe, the fur will fly, literally. But take the doe to the buck, and she will remain on good behavior. The buck will breed with the doe, usually immediately. After a few sniffs which apprise him of the situation, the buck promptly circles around to the hind end of the doe, mounts the doe, accomplishes the rabbit mating, and then falls off the doe with a grunt. Signs of success: the grunt and fall-off. The buck might also get all macho, and thump the cage floor a couple times. Occasionally, a buck will fire and yet miss. It might look every bit like a breeding, however he will not have hit the mark. So, when you remove the doe from the buck, you might want to check her vent area for the presence of sperm, seen as glossy moisture. A second rabbit mating before removing the doe seems to increase the success rate and litter size. Just leave the doe in the cage. The buck will catch his breath, lose interest in thumping the floor, and regain interest in the doe. He’ll remount her, she’ll lift her hind end, and a second mating will occur. Below: Notice how the doe's back is flat and long? She has stretched herself out instead of hunkering down. When she lifted her hindquarters the buck mated with her, and then he keeled over sideways with a grunt. These pictures are quite typical of a mating and the end of a rabbit mating. It is important that the doe not urinate for a good half-hour after the mating, to avoid washing the sperm away. It doesn't happen often, but I have once seen a doe urinate after the breeding, and the gelatinous mass of ejaculate fall to the floor. For this reason, I usually check the clock when the breeding occurs, and then wait a half-hour before removing the doe. The chances are very good that the doe will not void while in the buck’s cage. But if she does, she’s in the right place for a re-breeding. 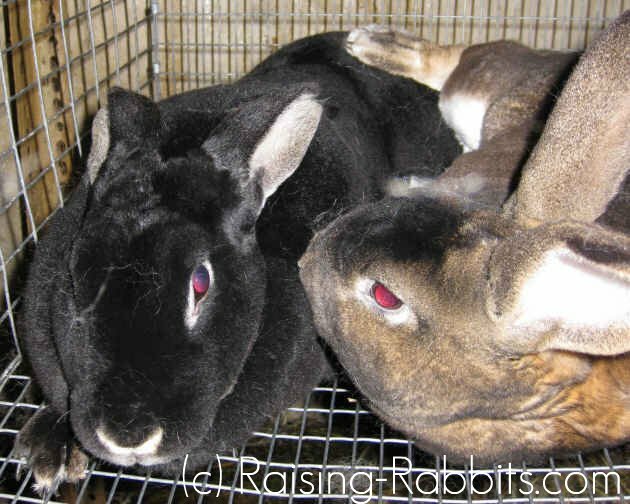 Keep a close eye on both rabbits, to ensure that the doe remains on good behavior. Be ready to remove her immediately if she starts growling or even attacking the buck. Some breeders like to see a third breeding. And frequently a third breeding might take place during the half-hour we leave the buck and doe together. But we are usually satisfied with two matings. Remove the doe to her cage. I like to toss hay into her cage, and a little bit of black oil sunflower seeds (BOSS) or whole oats into the feeder as a reward. There’s another reason too: to keep her mind off the condition of her bladder. She’ll go straight to the feeder or to the hay, instead of heading to the back of her cage where her toilet area is. It's just one more trick to give the doe the best chance at a big litter. Within 8-10 hours of mating, the doe releases eggs for fertilization (ovulates). The sperm are already present and the doe should become pregnant. The doe may become very cranky over the next few days. This is okay! Do give her space. Leave her in her cage. Leave her alone, if this is what she wants. Check our Pregnant Rabbit page for all the signs a doe will exhibit during the 31 days before she kindles, that indicate she's probably pregnant. 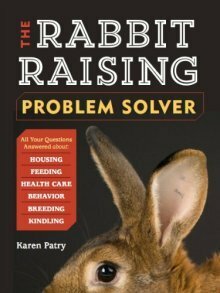 Rabbit Mating: What do you do when the doe doesn't cooperate with the buck? In my area, late autumn is when does want to just hunker into the corner of the buck's cage, and no amount of sweet-talking or complaining on the buck's part can coax cooperation out of the doe. Retry the rabbit mating in a day or two. The doe may be ready then. Check the weather forecast. 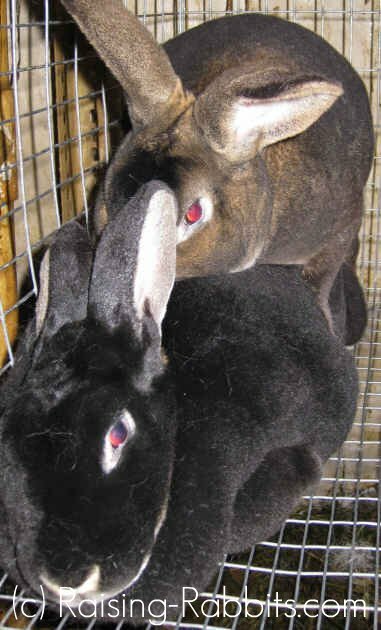 If the doe spurned an attempt at rabbit mating, you could plan to re-try the breeding when the barometer is rising or the temperature is warming. This works some of the time. You could try swapping cages. Put the buck in the doe's cage, and the doe in the buck's cage for an overnight stay. In the morning, or when you return to the animals, put the doe back into her own cage where the buck is waiting. She may be willing this time, since she is now familiar with the buck's scent. If the doe's tail begins to twitch, or if the doe begins circling to mount the buck, the doe is 'in the mood,' even if she circles the buck's cage at first.